Video game movies are a sore subject. When’s the last time you loved an adaptation of a video game? A few searches in IMDb might even help you to discover Street Fighter movies you wish you had forgotten. These are movies that look so awful in trailers you refuse to invest a fraction of what you paid for the actual game just to rent it. Let’s face it, the imaginative fantasies captured in video games weren’t mean for live action. Disney decided to skirt around the genre by creating an original character that interacts with real video game villains in its new CG animation movie, Wreck-It Ralph. It will be produced by Disney’s own animation studio (i.e. Chicken Little, Meet the Robinsons, Bolt). 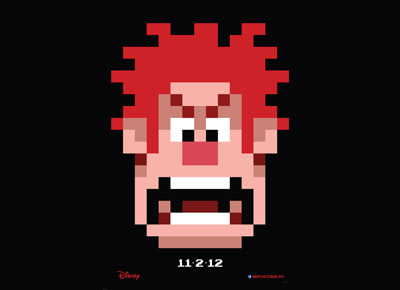 Gamers should love the 8-bit style of the Wreck-It Ralph and the movie looks like it falls under the things-that-happen-behind-closed-doors formula (think Toy Story). This entry was posted in Games, Movies/TV and tagged mortal kombat, pac-man, Sonic the Hedgehog, Street Fighter, super mario brothers, trailer, wreck-it ralph on June 17, 2012 by Mark Azali.